This article outlines how to configure your company types within the CRM. By setting an appropriate Company Type these can then be used to filter reports, such as a list of all Companies with a Company Type of 'Customer'. Please note that Company Types are set at Company Level. To configure your Company Types you will require Prospect 365 Administrator rights, if you require these then please speak to your key CRM user or our Customer Services Team. To edit your Company Types, click on the settings icon in the bottom left-hand corner. Once within the Settings Centre, navigate to the People & Places section & scroll down until you reach the Company types configure option. By selecting the 'Click to Configure' link the Configure Company Types window will open. Within this window all of your current Company Types will be listed. To add a new one click on the + icon in the top right-hand corner. Description: This will be the name of the new Company Type, make sure this is relevant to your users to ensure this type is assigned to the correct Companies. Change to when lapsed: A Company Type can automatically change to the selected Company Type, if the Company hasn't purchased from you after the pre-selected lapsed period. Within this drop down click the Company Type that the Company will change to when lapsed. 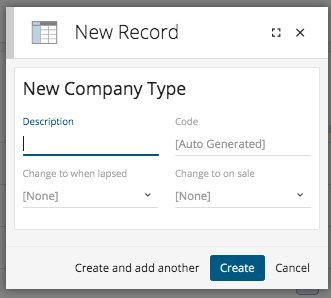 Change to on sale: A Company Type can automatically change to the selected company Type, if the Company has placed an order with you via the CRM. Within this drop down click the Company Type that the Company will change to when an order is placed. For example this may be 'Customer'. Once happy with the information entered click Create & your new Company Type will be added. You can also assign a colour to a type allowing the user to quickly and easily see from each record what type of company they are dealing with. 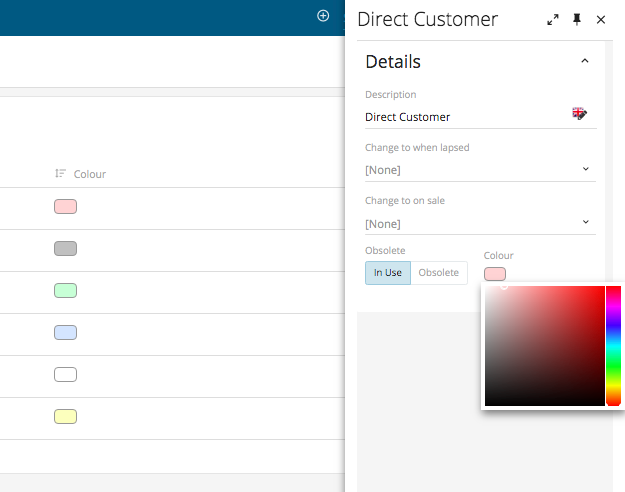 To configure a colour click on the pencil icon for the required Company Type & the below side panel will appear. Within the side panel you can click on the colour & select the desired colour from the colour wheel. Finally, you will need to set the lapse period if you have chosen to set a Company Type to change to once a Company has reached the lapse period. To do this navigate back to the Settings Centre & the Company type option within the People & Places section. Within here you can choose to automatically change the company type when a customer has not purchased anything from you in the last year or two.